Christmas Cartoon Timeline | it's yaytime! Growing up, I always tried to work ongoing entertainment franchises into a cohesive continuity…even if that was never the producers’ intention. Did the Ewok TV movies take place before or after “Return of the Jedi”? How could The Muppets share a nursery as babies but not know each other when they reunite in “The Muppet Movie”? This stuff kept me awake at night! My timeline for an imagined continuity for the Rankin/Bass Christmas Specials. Sort of a cross between Rudolph and Dumbo, this special tells the story of donkey with unusually long ears who is laughed at, but ends up being a part of the first Christmas in Bethlehem. He’s also an ancestor to Santa Claus’ donkey, the narrator of the story. 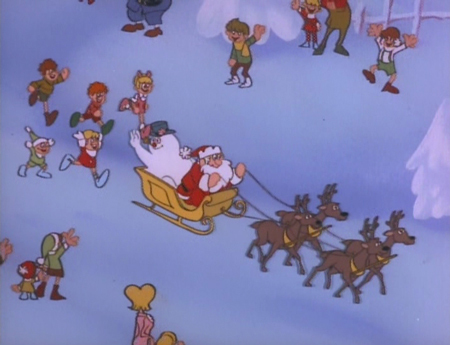 CONTINUITY NOTES: The framing/narration scenes feature Rudolph and elves that look like Jingle and Jangle from “Year Without a Santa Claus,” but the bulk of the story takes place in biblical, pre-Santa times (which is why this special starts off the timeline). 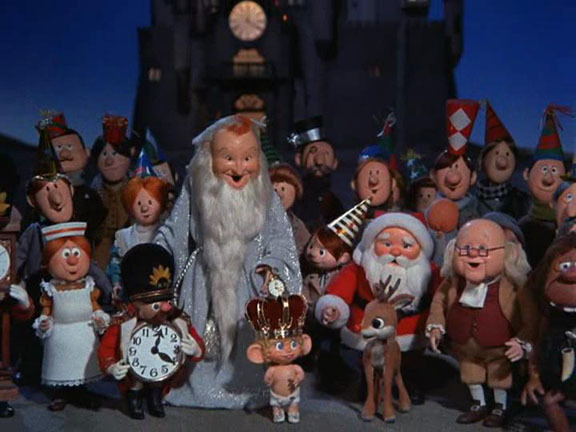 Even though Rudolph appears consistent with his other specials and Mrs. Claus and the elves look exactly like they do in “Year Without a Santa Claus,” for some reason Santa has creepy dark black eyes. This is the origin story of the friendly version of Santa Claus that appears in most of the Rankin/Bass specials. 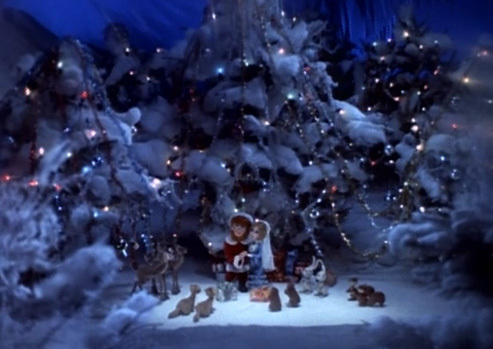 We learn that young Claus was an orphan raised by the Kringle Elves, who teach him how to make toys. 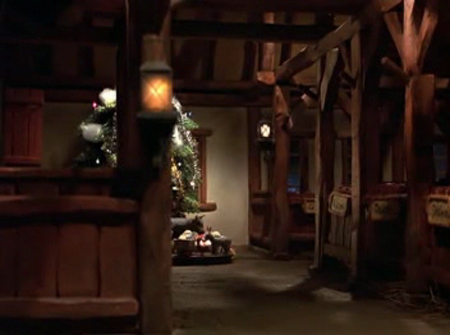 He meets a schoolteacher named Jessica, the future Mrs. Claus, whom he marries in the forest (after they become outlaws). He also meets the Winter Warlock, who gives him magic feed corn that allows reindeer to fly. CONTINUITY NOTES: In this cartoon they establish that Santa’s famous red and white outfit is based on the clothes the Kringle Elves wear. But in all the later specials the elves are wearing an alternate uniform. 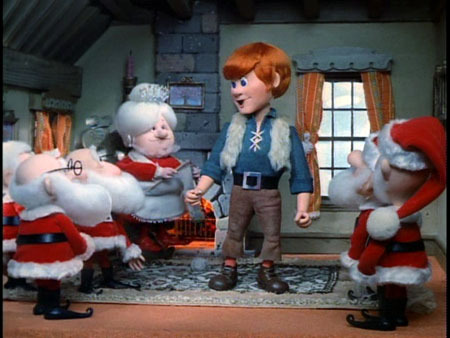 The elves and Santa, also have different facial features in the later specials (though not as drastically as between this and “Rudolph The Red-Nosed Reindeer”, so this is only a minor visual nitpick. 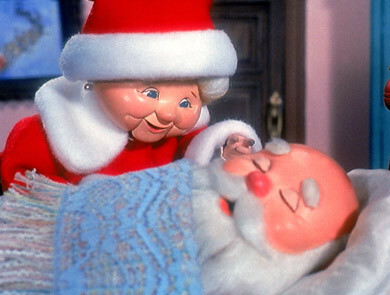 Santa is voiced by Mickey Rooney for the first time. There’s a quick aside establishing that this is long before Rudolph joins Santa’s sleigh team. 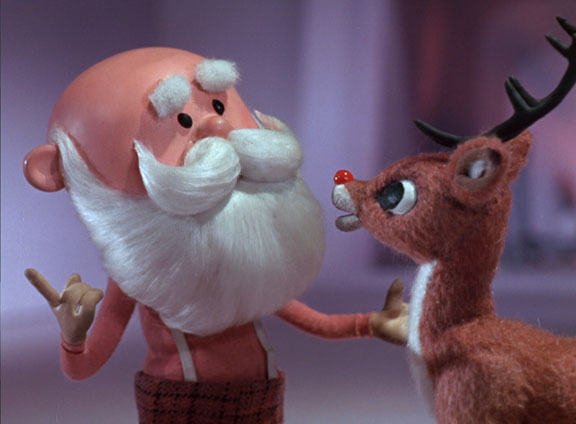 Rudolph is shown as the full-grown version we see at the end of the original TV special. This is the only other time we see him with his antlers. Tells the story of a sprite named Jack Frost, member of a team of immortal creatures who help create winter. Jack is curious about the human world, and falls in love with a mortal woman. He begs Father Winter (his boss) to temporarily turn him into flesh and blood so he can try to win the girl’s heart. While on Earth, he helps to overthrow a ruthless tyrant named Kubla Kraus and his clockwork Ka-knights. 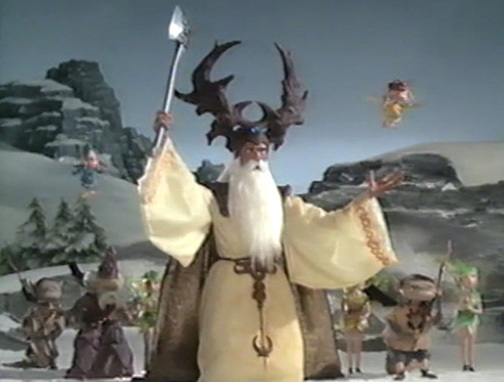 Father Winter is one in a series of winter personifications that appear in the Rankin/Bass universe, and for the most part, is a pretty reasonable guy. Jack Frost is voiced by Robert Morse only in this special. DAVE’S RECOMMENDATION: Steampunk horses? A bad guy who talks to a robot puppet on his arm? This is one of my favorites of all the Rankin/Bass specials, so forgive me if I spend a bit more time focusing on Jack Frost’s role in the other specials than any sane person should. A magical wooden boy (whom you may have seen in more famous incarnations) keeps getting tricked into misbehaving. Luckily the Blue Fairy, and eventually Santa Claus, are around to bail him out of trouble. 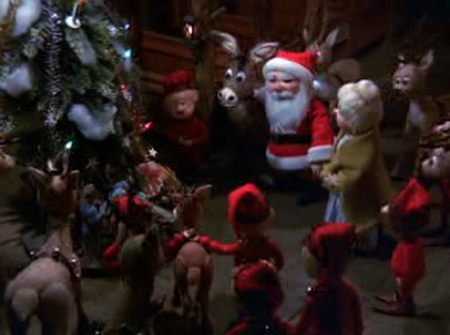 CONTINUITY NOTES: Santa and his reindeer appear pretty similar to the designs used in “Year Without a Santa Claus,” when Rudolph was not yet part of the crew. DAVE’S RECOMMENDATION: This special was surprisingly more enjoyable than I first expected. Mainly because of the great animation models and sets that on par with the best from Rankin/Bass and the animagic crew. A skeptical mouse pisses off Santa and is eventually browbeaten by his father into joining the flock of believers. There’s also a parallel story about a guy who builds a giant musical clock to get his town back in Santa’s good graces. CONTINUITY NOTES: Santa Claus has no mustache to reflect the poem that inspired the story. Seemingly set at the turn of the 20th century, based on clothing styles and technology. DAVE’S RECOMMENDATION: Despite its questionable attack on reason, I do find it to be one of the more charming Rankin/Bass specials, thanks to its catchy songs and distinctive art direction. Santa gets sick, so Mrs. Claus gets to take an active role in an adventure. Set in a time where people are starting to doubt the existence of Santa, Mrs. Claus tries to prove there’s still some Christmas spirit left in the world. 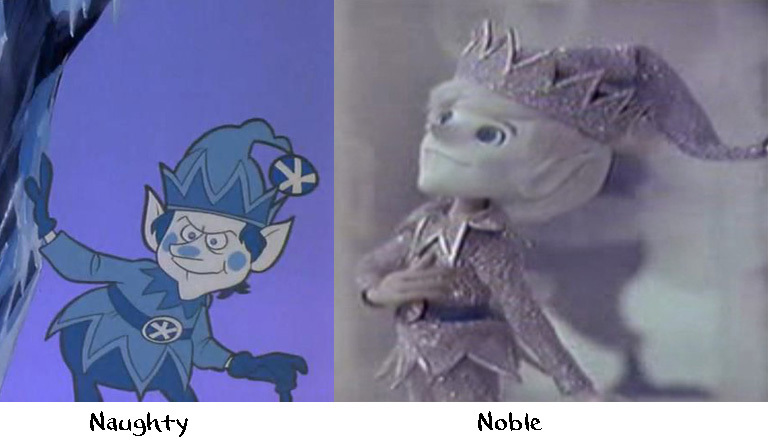 The godlike Snow Miser is another in a series of personifications of winter that appear in the Rankin/Bass specials. We also get to meet a personification of summer (Heat Miser) and Mother Nature. Santa is once again voiced by Mickey Rooney. Rudolph still hasn’t joined the reindeer sleigh team. DAVE’S RECOMENDATION: Despite a few awkward moments, this one remains a classic for good reason. The Snow Miser/Heat Miser song is one of the best songs in all of the Rankin/Bass specials (or Christmas, for that matter). Shirley Booth is fantastic as Mrs. Claus, even if the scene where she admits to fantasizing about dressing up as her husband is funnier than the producers probably intended. I actually wish the Mrs. Claus-in-drag plotline continued beyond just the singing of “I Could Be Santa Claus”; so much untapped potential! 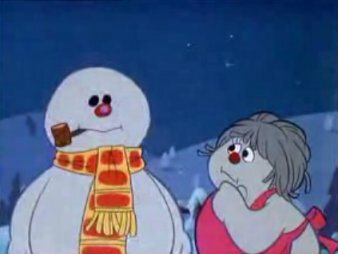 Introduces Frosty, a snowman who comes to life with the aid of a magic hat and becomes good friends with a gang of children. To avoid melting at the end of winter, he decides to move up to the North Pole with the aid of a kid named Karen and Hocus Pocus the rabbit. CONTINUITY NOTES: Santa is voiced by Paul Frees, and is a completely new design from any of the other specials. He only has four reindeer, and no Rudolph. 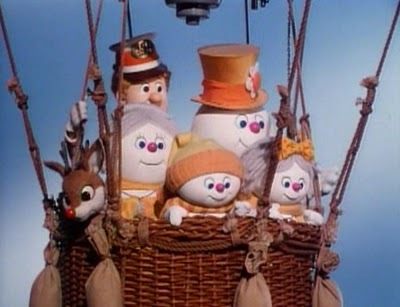 Frosty grows bored of living up in the North Pole, so he heads back to town to visit his friends, the nameless children. Since Frosty gets lonely when the kids go into their warm homes each night, they decide to build him a snow wife. All this attention on the magical snow folks makes Jack Frost jealous, until he’s asked to join the wedding party. Jack Frost starts out as a cranky pest who feels overshadowed by Frosty, but is possibly reformed by the end of the special? Visually he has a similar costume to his solo special, but is much shorter and squatter than in later appearances. Here he is voiced by Paul Frees. 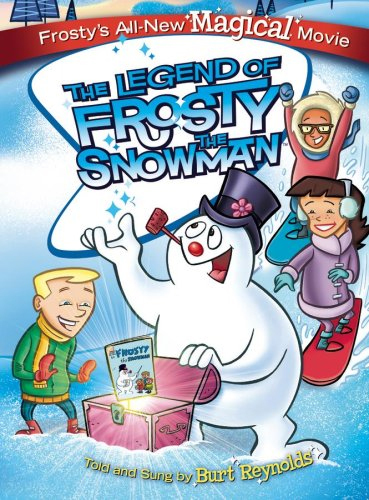 Frosty’s pal Karen, a major character in “Frosty the Snowman,” (she risks her life to save him) is nowhere to be seen amongst the kids Frosty specifically returns to hang out with. Hocus Pocus the rabbit is also never seen again. 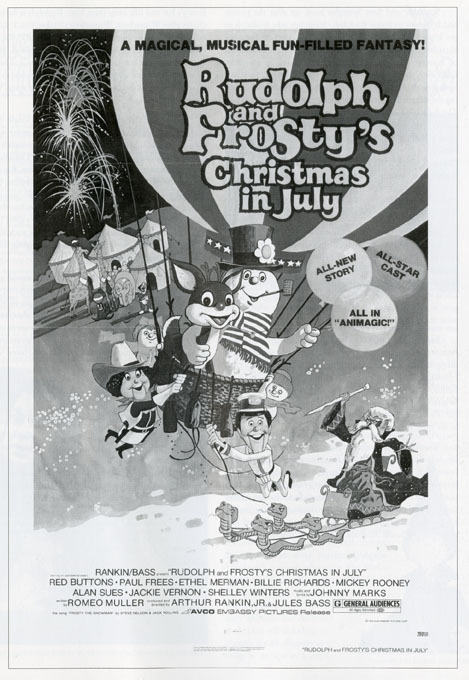 Since Crystal’s love (and ice bouquet) brings Frosty back to life (after Jack Frost steals his magic hat), you could infer that Frosty no longer needs the hat to stay “all livin’”, but that doesn’t seem to be the case in the “Christmas in July” feature film. The TV special that started it all. You’ve all seen it. You all love it (unless you have no heart!). Showcases the origin of Rudolph for the first time…but certainly not the last! If you are taking this timeline seriously, this is the point in the continuity where Rudolph officially joins the sleigh team and becomes the Most Famous Reindeer of All. CONTINUITY NOTES: By the end of the original special, Rudolph has clearly grown up (taller and with fully-grown antlers) but in all future specials/movies, he is back to his young buck persona and body type. “Rudolph the Red-Nosed Reindeer” has completely different art direction and design compared to the rest of the specials. More UPA style influence, dots for eyes, elves dressed totally mod, and Santa as a skinny jerk most of the year. Rudolph is asked by Father Time to go on a quest to track down the missing Baby New Year. He travels through the Archipelago of Last Years, islands where time remains frozen. Along the way, Rudolph meets Big Ben the whale, and a bunch of other interesting (and sometimes uninteresting) characters that have no connection to any of the other Christmas stories. CONTINUITY NOTES: Rudolph has reverted back to his sans-antlers pre-pubescent self, even though story clearly takes place after the events of the original Rudolph special. There is an interesting flashback featuring the classic Rudolph song with a 2D animated reimagining of scenes from the original stop-motion special. Santa is drawn in that Paul Coker, Jr. style that is really close to his appearance in “’Twas the Night Before Christmas,” except he’s got the full mustache along with the beard. Reindeer Games involve playing with a spotted ball, rather than learning to fly (as was the case in the original special). 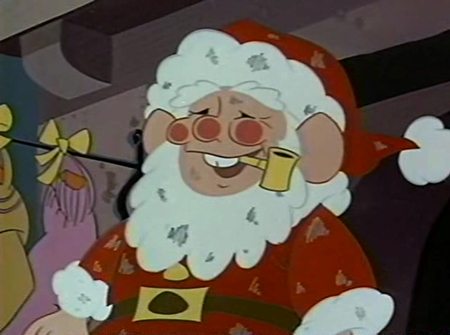 Paul Frees is the voice of Santa but the design is pretty much the same as the Mickey Rooney Santa in “Year Without a Santa Claus” (except in the 2D flashback mentioned earlier). This full-length feature film that was actually released in movie theaters is where everything intersects. It’s the Crisis on Infinite Earths for holiday specials. Rudolph and Frosty (seen for the first time as a stop-motion puppet!) are established as good friends and we meet his children Chilly and Milly. They all join the circus, and get tricked by a dark wizard named Winterbolt, who wants to overthrow Santa. CONTINUITY NOTES: Rudolph’s origin is re-imagined with a retroactive continuity about a hidden tattoo and magical justification for his glowing nose that was given to him by the Aurora Borealis (in human form). During the callback to the discovery of Rudolph’s red nose, Donner is joined by other members of his sleigh team. In the original Rudolph special, as well as the callback in “Shiny New Year,” the moment is just between father, mother and son. We see Santa’s reindeer stall, which previously only appeared in “Nestor, the Long-Eared Christmas Donkey.” The pivotal moment where Santa asks Rudolph to guide his sleigh takes place here, instead of inside Santa’s castle (as in the original Rudolph special). We see a photo of Father Time from “Shiny New Year” on the wall in Rudolph’s trailer. We also see the return of Big Ben the whale from the same special. Jack Frost also shows up at the end, to help save the day. This Jack is sort of a hybrid of his villainous version in “Frosty’s Winter Wonderland” and the romantic hero of his own special—with crazier hair. He’s voiced by Paul Frees (as per his villainous “Winter Wonderland” appearance). This feature film blowout was the last of the original stories produced by Rankin/Bass featuring Rudolph, Frosty, Santa, and Jack Frost…thus ending the timeline. This lesser-known special is based on an L. Frank Baum novel that is clearly a separate continuity/origin of Santa. It’s kind of like a pagan Christmas with all sorts of fairies, wood nymphs and mystical beings. I personally love it because of its distinct differences, unique characters and amazing puppet designs. You can listen to me talk about it in depth on this episode of Saturday Supercast. Despite being shown annually after the original “Frosty The Snowman” and packaged along with it on the DVD, this is actually not a Rankin/Bass special. It was produced and animated by the same people who do the Peanuts cartoons! If you try to connect it to the other Frosty specials (like I did before finding out its origins) your head will explode. Haven’t seen it! But the designs are based on the original special and supposedly there are callbacks to it. It’s probably worth tracking down because Burt Reynolds is the narrator! Despite the confusing title, this is a CGI sequel and not a remake as I first suspected. Rudolph uncovers a plot by the Evil Toy Taker to start a toy rebellion. CONTINUITY NOTES: This special features the return of Hermey the dentist elf, Rudolph’s girlfriend Clarice, and the Misfit Toys! DAVE’S RECOMMENDATION: This is only worth watching as a curiosity piece. It’s almost like a fan-made film…and there is a lot of potential in the story threads. But the early CGI is extremely dated, the pacing is slow, and the songs are painful. Tinsel, a mechanic elf, creates a new rocket sled for Santa and convoluted hijinks ensue. Santa ends up pulling his back, so Heat Miser and Snow Miser put aside their sibling rivalry to help him out. CONTINUITY NOTES: This special introduces The North Wind, yet another personification of winter…and brother to Snow Miser and Heath Miser! 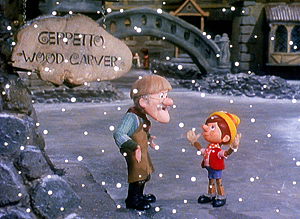 Mickey Rooney reprises the voice of Santa, and George S. Irving reprises the voice of Snow Miser. DAVE’S RECOMMENDATION: This special is the best of the non-Rankin/Bass sequels. The designs and animation are actually of very high quality. WHEW! Did I miss anything? I’d love to hear from other Rankin/Bass fans and will happily add future annotations. Special thanks to Rick Goldschmidt, author of The Enchanted World of Rankin/Bass: A Portfolio, a useful resource in compiling this list. Tom Krohne, who’s own Rankin/Bass list helped me solidify some of the entries. Jerzy Drozd, Kevin Cross, and Shawn Robare, whose episode of Saturday Supercast poured gasoline on Christmas fire. Pingback: Christmas Cartoons Forever | it's yaytime! I think I’ve seen everything on this list but I had forgotten about some of them until I looked at it!!! Holy crap! I still love The Life and Adventures of Santa Claus best of all, though. And I thank you for that good sir. By the way, “Rudolph’s Shiny New Year” was their “jump the shark” moment for me. Tim, I sorta agree, except when most people claim franchises “jump the shark” that’s when I find them to be extra interesting on a whole other level. I love when stories go off the deep end. Especially when formally realistic TV shows start introducing random cousins, aliens, magic powers or whatever. Whatever it takes to keep those corpses animated! I know what you mean. Like the last season of “Lavern and Shirley.” At least most of the last season I believe had NO Shirley, as she refused to show up for contract reasons I can’t remember just now! Good timeline except for the fact that you forgotten The Little Drummer Boy specials. Yep, you forgot “The First Easter Rabbit” and “Here Comes Peter Cottontail.” Santa is voiced by Paul Frees in both. The former also has another ice/snow personification named Zero. He looks very similar to the Winter Warlock and Winterbolt. This is so interesting! I love seeing such a detailed timeline for the Rankin Bass specials! I don’t hear many people talk about these specials with so much detail, so I really appreciate this. Like one other person pointed out, you didn’t mention The Little Drummer Boy or its sequel as one of the films that don’t include Santa, Rudolph, etc. Excluding non-Christmas movies like Peter Cottontail or The Easter Bunny Is Comin’ To Town, you also didn’t mention The Cricket of the Hearth (1961), The First Christmas: The Story of the First Christmas Snow (1975), The Stingiest Man in Town (1978), and The Leprechaun’s Christmas Gold (1981). These are often glanced over, so I don’t blame you for forgetting about them. Though, if you haven’t seen them, I suggest giving them a watch. The first and last ones I say watch for curiosity-sake, but they’re both….interesting. The First Christmas is very charming, and I say it’s definitely worth checking out. I have yet to see The Stingiest Man in Town, but from what I’ve heard, it’s basically Rankin Bass’ adaptation of A Christmas Carol. You are so awesome! I do not suppose I’ve truly read through anything like that before. So great to discover somebody with some genuine thoughts on this subject matter. Really.. thanks for starting this up. This website is something that is needed on the web, someone with a little originality!